After an amazing multi course meal complete with vintage champagne and cocktails in the First Class lounge, we were ready to make the most of the bed on this flight. In a way, it seemed like a waste having such an amazing product and only using it to sleep… but on the other hand it was nearly 3am, we had experienced apartments before and I was really hoping to get a decent sleep before heading straight to the office a few hours later ? 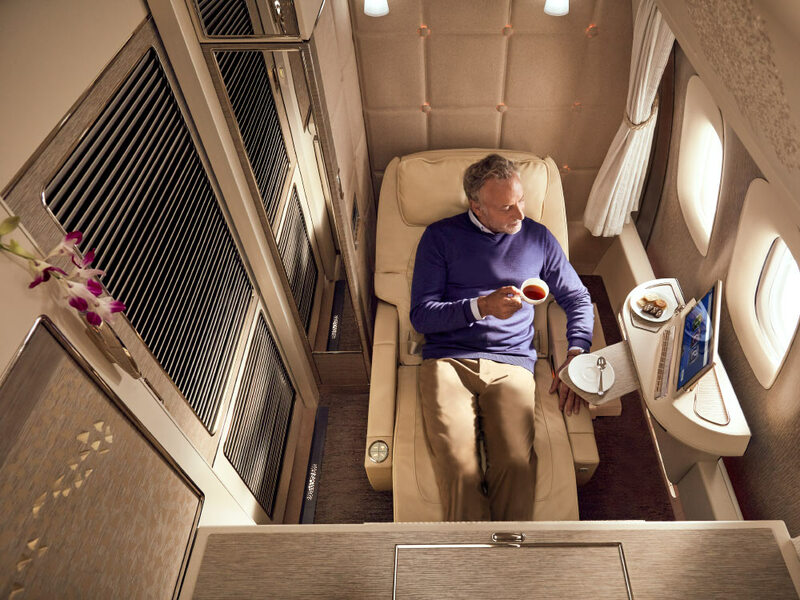 I thought that perhaps Etihad’s apartments would lose their impact on a repeat trip, but walking into the elegantly lit cabin with its single aisle and geometrically cut walls was just as breathtaking the second time around. Once again, we selected seats 3A and 4A since they have a central wall which descends to make a double bed. 3K and 4K are equally good. 1H and 2H also offer a double bed but the seats are close to the aisle rather than the windows, which means no views during take off and landing. The bed is also set up so that your head faces away from the windows, preventing you from enjoying the epic majesty of a sunrise over the wing of an A380. We were greeted by a number of staff members before take off, including the cabin manager, chef and and a flight attendant who offered us a welcome note, cold towels, dates, Arabic coffee and champagne. Trying my best to look normal, five or six drinks into my Sunday night. Kamara looked so abnormal that she insisted her face be struck from the record (but the joke’s on her, since her right hand still looks like a claw). Given the short flight time and late departure the crew were well prepared for most people to try and maximise sleep. When we mentioned to the chef that we were not really interested in dinner we were told that we could have the bed made up before take-off so that we could jump straight in once the seat belt signs were turned off. The chef also offered to serve us a hot drink in bed and said we could reserve whatever we wanted for breakfast the following morning. He also told us that he would endeavour to serve as close to our landing time as humanly possible. This makes quite a change from some airlines that insist on serving breakfast 90 minutes before landing on a 6h30 red eye (I’m looking at you BA). The bolster pillows and turndown notes really make the Etihad apartments feel like a hotel room. After a good 6 hours of sleep I woke up and pressed the call button. The friendly chef appeared moments later to offer hot drinks and ice cold water. He said that our steak sandwiches would take around 15 minutes to prepare but he could give us fruit and yoghurt in the meantime in case we were hungry. This guy was really great and went above and beyond simply reheating and plating things. The guy was clearly very customer service orientated and it actually felt like a shame that we only got to experience his hospitality for a relatively brief time. I asked for the beef rare and my yolks runny (my cooking preferences always mean I get the freshest food and quickest service ?) and this was delivered exactly to specifications. The beef was of a high enough quality that it melted apart with each bite of the bread, a lesser quality cut would leave you with a large bit of steak hanging from your mouth and and a wet, bread ‘glove’ in your hands. Something of an improvement over my usual Monday morning commute on the Central line. I finished my awesome breakfast with around 40 minutes to go before landing. Just enough time to brush my teeth and get changed for work. I once again managed to blend seamlessly into my surroundings with my choice of clothing. I have no idea how I keep managing to do this. Kamara looking fresh as a rose after a sub 8 hour redeye. A testament to the benefits of flying First Class! At the time I booked this flight the incremental cost of First over Business was only 10k AA miles, which I value at around £100. This is pretty much the definition of a no brainer, particularly since we were granted access to the First Class Lounge for a spectacular dinner before our flight. This meal alone would have been worthy of the £100 price tag. Whilst it’s true that we didn’t go all out to maximise the value fo the flight by staying up all night drinking champagne and eating steaks, I still feel like I got undeniable value out of the ability to get as much sleep as possible, get changed into sleepwear without waiting in line in the morning and arriving at work well rested, after spending the weekend in a sunny location three and a half thousand miles away!